Of course I had to make a birthday card. I used 4 different stamp sets. For the color combination I was inspired by the current color challenge #50 from the "Inky Paws Challenge" . Below you can see a close up from all the stamp. * Natuurlijk moest ik een verjaardagskaart maken. Ik gebruikte 4 verschillende stempelsets. Voor de kleuren combinatie was ik geïnspireerd door de huidige kleuruitdaging # 50, van de "Inky Paws Challenge" . Hieronder ziet u een close-up van alle postzegels. After making cake, it's time to eat some hihi... Interactive cards are just too much fun to make; so if you open the card you see the big cake. The coctail next to the cake is from a set from our new release!! * Na het maken van cake is het tijd om er wat van te eten hihi... Interactieve kaarten zijn gewoon erg leuk om maken; als je de kaart opent, zie je de grote cake. De cocktail naast de taart komt uit één van de set van onze nieuwe release!! Celebrate with us and enter to win! 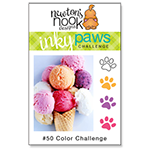 To celebrate 4 years Newton's Nook Designs is giving away a $25 store credit to spend in their online shop to 4 lucky winners! Here's how to win: Comment on the NND Design Team and Special Guest blogs (see list below)! The winner will be chosen at random from the collective blog hop posts. Make sure to check out each of their blogs and comment for your chance to win. You will not know which blog has been chosen so the more you comment on the better your chances are of winning! You have until Sunday, July 16th at 9pm CDT to comment. Winners will be announced on NND blog post on Monday, July 17th and will need to contact us to claim their prize so make sure you check back to see if you've won! * Vier met ons mee en doe mee om te winnen! Om vier jaar te vieren, geeft Newton's Nook Designs een $ 25 winkelkrediet aan voor hun online winkel voor 4 gelukkige winnaars! 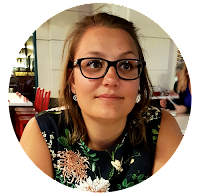 Hier is hoe je kan winnen: Reageer op de blogs van de NND Design Team en Special Guests (zie onderstaande lijst)! De winnaar wordt willekeurig gekozen uit de collectieve blog hop posts. Zorg ervoor dat je dus elk van hun blogs bekijkt en een berichtje achterlaat voor je kans om te winnen. Je weet niet welke blog is gekozen, hoe meer je dus schrijft, hoe beter je kansen! Je hebt tot zondag 16 juli om 21 uur CDT om te reageren. Winnaars worden op maandag 17 juli aangekondigd op NND blog post en de winnaars zullen ons moeten contacteren om hun prijs te claimen, dus zorg ervoor dat je de post achteraf bekijkt om te zien of je gewonnen hebt! If that's not enough. 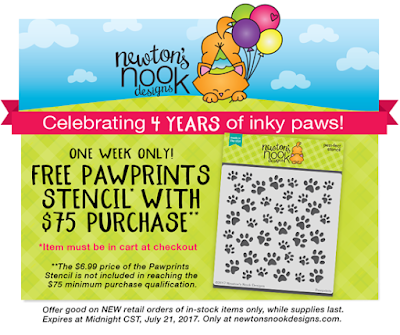 To celebrate the fourth birthday, Newton's Nook Design also gives away the "Pawprint" stencil with purchase over $75. Than more people can enjoy the birthday. * Als dat niet genoeg is. Om de vierde verjaardag te vieren, geeft Newton's Nook Design ook de "Pawprint" stencil weg met bestellingen meer dan $ 75. Zo kunnen meer mensen de verjaardag genieten. This is a really fun card! I love the sentiment and all of your amazing details too! Awesome! I don't know which I like better, the front or the inside. Interactive cards are such fun and this one is gorgeous! Awesome card, inside and out. Awwwwww, your card is beyond amazing! You have totally knocked it out of the park this week! Another amazing card!! Oh, this is just so awesome! Fabulous design and amazing coloring! What a fun card I like how you have those hidden images under the panel. So much time and love went into making your wonderful card! I love the interactive design and how you colored all the images. Definitely a FUN card! oh wow! This is so pretty! I love how the card opens to reveal the big cake and a cocktail too! What a purr-fect birthday surprise! Thank you so much for helping to celebrate our Anniversary today! Oh how cute and sweet, I am a baker myself, this is so very perfect for me! Oh too much fun going on here, love your coloring and colors and all the different sets you've used to make this great card! Very cute little card! Love how you coordinated so many elements to make this scene work. Love how you combined sets to make such adorable cards! Also love the color scheme. So cute. The inside of the card is as beautiful as the outside. Darling card! Newton is having fun in the kitchen! Fun card. Love the interactive element!! Oh wow what a cleaver card! ❤️ love it! 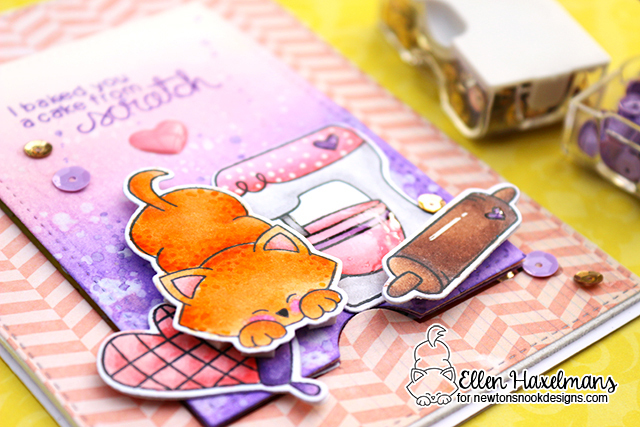 Beautiful card - love NN products and how you have used them on your creation!!! Thank you for sharing your idea. What a super card for a birthday greeting. Aww, this is just adorable!!! Love the interactive feature you added and the mixer is just fab!!! Cute kitchen scene--I like the pretty colors and that it is interactive. A very yummy card !!!! Super sweet interactive card!Great for the occassion!Happy 4th bday NND! Love those kitty cats.. Always into trouble huh? Cute cards and adorable set. Love the colors on this! My daughter has been baking quite a bit lately and she love kitties. I might have to get these stamps for her. I love the drink set! My cat loved coffee... probably more the CREAM :) Super celebration card! I've never seen an interactive card like this before - I love it! Then again pink, purple, cats, and cake are some of my most favorite things. Great card! great cards, love these kitties! Wow! This card looks fantastic. Imagine the person who receives this card opening the little flap to find that the inside is decorated and just as adorable! Wonderful job!! Fabulous card! Those cats are adorable. What a fabulous and fun idea! This card is awesome and colored so perfectly. What a fabulous fun card!! A great card design with the hidden panel!! Beautifully coloured and the scenes you created on the front and inside are perfect!! This is a beautiful birthday card!! 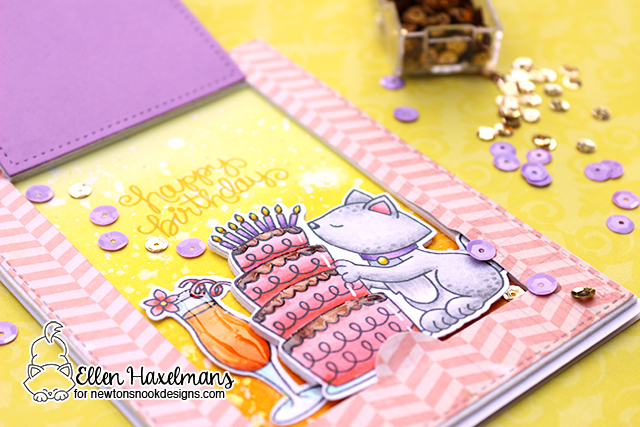 A purr-fect card to celebrate NND's 4th birthday! Fabulous use of this week's IPC colors!